Social transformations connected to changes in economy and technology are questioning seriously our traditional ways to conceive culture, social relationships, communication, creativity and innovation. On one side, individual creativity seems to become the main engine of the world around us. On the other side, the rise of collective intelligence in social networks and the uncountable artistic, political and social bottom-up experimentations fostered by new technologies, are challenging the romantic myth of individual creativity. Invited Guests: Lev Manovich, Michel Bauwens, Steve Kurtz (CAE), Kenneth Goldsmith, Adam Ardvisson, Marc Fornes, Joanna Demers, Norbert Palz, Geert Lovink, Daniel Dendra, Julien Ottavi (Apo33), Mattin, Eric Deibel, Marc Dusselier, Sara Tocchetti, Sonia Campanini, Luciano Palumbo, Pasquale Napolitano. 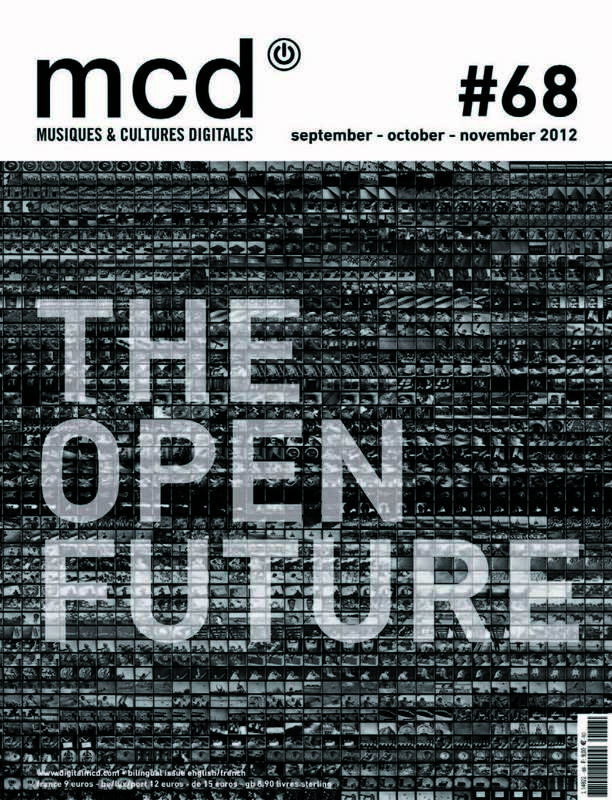 Marco Mancuso was contacted by Anne-Cécile Warms, head editor at MCD Magazine, from 2003 one of the most printed magazine worldwide about digital art and culture, to curate a special issue of the magazine around the impact of open technologies on the main fields of contemporary culture: art, audiovisual, design, internet, music and science. Marco Mancuso contacted 5 authors from the Digicult network, to curate the 5 different sections in which the publication its devided. Recent years are witnessing radical transformations in the relationships among art, science, design and society. The progressive de-institutionalization of the forms of production, management and consumption of material and immaterial goods brought by new technologies (desktop manufacturing, DIYscience, 2.0 communities) is reshaping the way we conceive culture, giving more importance to bottom-up taxonomies of reality (i.e. the folksonomies) and questioning traditional paths of change (Open Innovation) and power (p2p communities). Analytically we can say that this phenomena are acting both horizontally and vertically. Horizontally, they are blurring the borders between different fields and disciplines, merging methodologies, languages, tacit and explicit know-hows. Vertically, they are affecting the distinction between “high”, academic approaches and “low”, ingenue ones. This cross-pollination creates enthusiasms and skepticisms at the same time. On one side it’s perceived as an unforeseen expansion that will led to continuous innovation. On the other side it’s seen a a menace for stability, quality and fairness. This monographic issue will explore this panorama according to six curators specialized in five different fields. Firstly, Bertram Niessen will investigate the social ambiguity of digital creativity, the chances given by bottom-up co-production and the challenges offered by web-based practices of creative sharing. Secondly, Claudia D’Alonzo and Marco Mancuso will focus on the changes taking place in relation to creation practice, dissemination and fruition of audio-visual artistic contents. Thirdly, Elena Biserna will provide an overview on musical artistic practices and, at the same time, show the significance of this scenario in the sphere of cultural and everyday practices. As fourth, Sabina Barcucci will investigate reasons, state of the art and developments of the relationships among design, education and complexity, looking at the new cognitive forms as the output of such phenomenon. Finally, Alessandro Delfanti will examine the problem of the transformation of science expert epistemology, focusing on the political, artistic and cultural dimensions of biohacking and DIYbio. Recent social transformations connected to changes in economy and technology are questioning seriously our traditional ways to conceive culture, social relationships, communication, creativity and innovation. On one side, individual creativity seems to become the main engine of the world around us (“be creative” seems to be an imperative that no one can avoid). On the other side, the rise of collective intelligence in social networks and the uncountable artistic, political and social bottom-up experimentations fostered by new technologies are challenging the romantic myth of individual creativity. The multiplicity of information ecologies (and the consequent fragmentation of values and symbolic systems) suggests that we are entering a phase that calls for the ability of letting emerge meanings and practices from the complexity itself, questioning the ideology of individual creativity and evaluating in a new way the social innovation nurtured by peer-to-peer networks. The Internet/social section aims to investigate the ambiguity of digital creativity, the chances given by bottom-up co-production and the challenges offered by new practices of creative sharing. During the last few years, the worlds of technologies and communications have been marked by the emergence of phenomena such as open access information, peer to peer and open source. Known as “digital commons”, these free and open source kinds of production and distribution phenomena, are expanding their influence on the cultural and artistic practices in a broad sense. Today, defining the scope of this revolution in the world of contemporary visual art productions, is a very complex path. We’re just beginning to discover the possibilities related to video delivery platforms, to historical audiovisual archives digitization, to networks of participatory production and peer to peer sharing of copyrighted works and contents. Moreover, spread of free licenses (copyleft) raises questions about the redefinition of the authorship concept, intellectual property and artistic heritage, not only to artists and curators but also to archives and research centers and institutions. The audiovisual section aims to trace possible paths within a landscape so vast and evolving, with the aim of highlighting some of the changes taking place in relation to creation practice, dissemination and fruition of audio-visual artistic contents. The deep transformations that, in recent years, are redefining cultural production and consumption, assume widespread significance and particular evidence in the fields of sound and music. The questioning of the western idea of authorship, the DIY ethos, the practices of re-appropriation, recombination and sharing, the challenge to the predetermined boundaries between (active) production and (passive) listening have been the cornerstones of sound experimentation in the second half of the 20th century. Digital technologies, peer to peer systems, free software and open platforms standardize and extend these processes, setting the stage for broader and collective sharing and collaboration that redefine the ways as well as the formal and institutional frames for music and sound production, distribution and reception. The music and sound section aims at investigating this multilayered and expanding scenario providing an overview on artistic practices and, at the same time, showing its significance in the sphere of cultural and everyday practices. Current production and informational systems are producing more and more emergencies phenomena: complex systems arising out of a multiplicity of simple interactions.Computational design is becoming a disruptive approach to define methodological, conceptual, and technical set of instruments to re-materialize such complexity in the physical world. Digital fabrication and the new forms of associative design and planning are significant outputs of the efforts made by architects and engineers in these fields.Emergences from complexity arise some key questions. As a consequence of the overwhelming growing “digital chain” in design process, will the paradigmatic shift in professional identity bring the human figures out of this automated process? The mankind will still keep a key role in future scenarios? And if yes, which ones? In a cultural and technical environment where forms and techniques change too fast and too often, do forms and languages have meaning anymore? This section will deal with these questions through a dialogue with a materialist philosopher, an architectural historian and an architect. Also science is facing tremendous changes due to the emergence of peer-to-peer production models. But beside being part of a global change in the way knowledge is produced, science has important peculiarities. In this field, the rise of open collaboration involves the blurring of the boundaries between scientific experts and lay citizens: a problem of power and a transformation of science expert epistemology. The walls of science’s ivory towers are not firm anymore, and citizens are more and more commenting, discussing, deliberating and producing scientific knowledge. In this changing scenario, the emergence of do-it-yourself communities that work on biology and genetics is one of the more visible novelties. DIYbio is a community of biohackers, established in Boston in 2008 and now represented by local groups in dozens of cities around the world. Interesting, an important part of DIYbio is composed by bioartists interested in the political potential of the diffusion of biology to lay citizens. Their use of open source tools, their relation with hackerspaces and their political attitude are important features that are shaping the way science is done in today’s societies).